For my son’s 3rd birthday he wanted a dinosaur theme. Of course, being a 3 years old, he didn’t want a regular cake or a dinosaur cake. 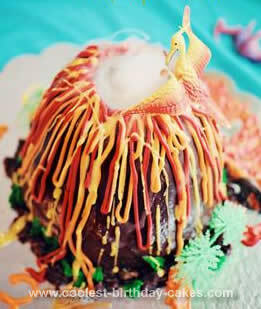 He HAD to have a Prehistoric Volcano Cake! Soooo… I set out to make one. My son has a severe egg allergy so I had to alter the recipe. I took 3 cake mixes- Duncan Hines triple chocolate mix. Each box was mixed separately and I took one can of 7 up and the cake mix and mixed it together. NOTHING else. Just soda and mix. I poured each mixed box of cake into one of 3 different sized Pyrex bowls (small, medium and large). Each bowl was greased and lightly floured prior to pouring the mix. (Using the soda method makes the cake a bit more dense and they tend to shrink up, so keep this in mind if you choose to use that method.) The baking took a bit longer than I expected it to… over an hour for each cake! However, I had enough for the 3 bowls of cake and 12 cupcakes, which worked out perfectly! After the cakes were baked, I wrapped them in Saran wrap and put them in the freezer. This made them SO much easier to carve and I felt like it made them more moist, as well. The following day (day before the party) I took them out and unwrapped them. Using a serrated knife, I sliced off the uneven top of the two larger sized cakes (just enough to make them flat on top for stacking). I placed the first, larger layer on a silver cake board and ‘dirty iced’ the biggest cake and then stacked the middle cake on top and repeated the ‘dirty ice’ process before putting the top cake (uncut) on the top. Before icing the top I took a CLEAN, small green chile can (you can use whatever) and cut out a hole in the top cake layer big enough to JUST fit the can. I then iced the ENTIRE cake with a nice, thicker layer of chocolate frosting, covering the rim of the can so that the only visible part was the inside of the can. Next, using red and orange decorator’s icing, I swooped up and down the cake from top to bottom (think ultra skinny U shape), back up to the top to form “lava”. I used a shimmery yellow gel frosting (from Party City) and did the same. For “rocks” at the bottom of the volcano I took the shavings I had cut off the cake and rolled them into different sized rough chunks. I used these to cover up any sloppy looking frosting from the cake. I used green frosting to pipe some “leaves” and fern looking plants at the bottom as well. I chose to let the lava ‘flow’ to the cake board and pool at the bottom of the cake (I swirled the 3 lava colors together… this made a cool effect with the shimmery one in there!). I took clean small dinosaurs and plastic plants and put them around the volcano to make them more realistic and a large pterodactyl at the top, resting on the chile can. I think it turned out great! For added effect I bought dry ice (was available for $1.09 a lb at Shopper’s Foods)and put one large chunk in the chile can and added a tiny bit of water to let the volcano ‘smoke’. If you choose the dry ice method, just be SUPER careful not to touch the ice! My husband almost had an accident with it… it holds up well in the freezer in a 1/2 gallon thermos for SEVERAL hours though. I used a slotted spoon and tongs to take out the ice and place it in the can. The kids and parents were all amazed and thought I had a specialty baker make it! I couldn’t be more proud! Also, the triple chocolate cake was SOOOOO good! It was like a fudgey, chocolaty piece of heaven. EVERYBODY was in LOVE with it. Gooood stuff! Good luck and I hope this helps! Seems like a bit of work, but the look on my 3 yr old’s face was SO worth it! The pic is from our professional photographer friend who took photos of the party since I was running around like crazy and unable to.